Home»Useful Information»What are Oil-Filled Capacitors? 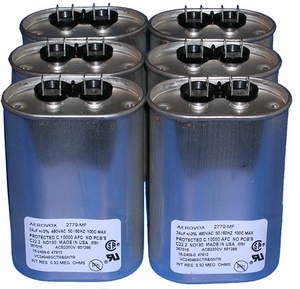 Oil-Filled Capacitors supplied today contain non-PCB oil and are a UL recognized component. Oil-Filled capacitorsare only supplied with ballasts where the capacitor operating voltage cannot be satisfied by Dry Film Capacitors. When required, the capacitor discharge resistor is connected across the capacitor terminals. Additional precautions must be taken when an oil filled capacitor is installed. Underwriters Laboratories, Inc. (UL) requires clearance of at least 3/8 inch above the terminals to allow for expansion of the capacitor in the event of failure. The maximum case temperature for Oil-Filled Capacitors is 90C.